I recently was informed by another photographer that a website: www.allvoices.com was using my images. This was news to me since I had never heard of www.allvoices.com and more than that, I had never sold or licensed any of my images for them to use. 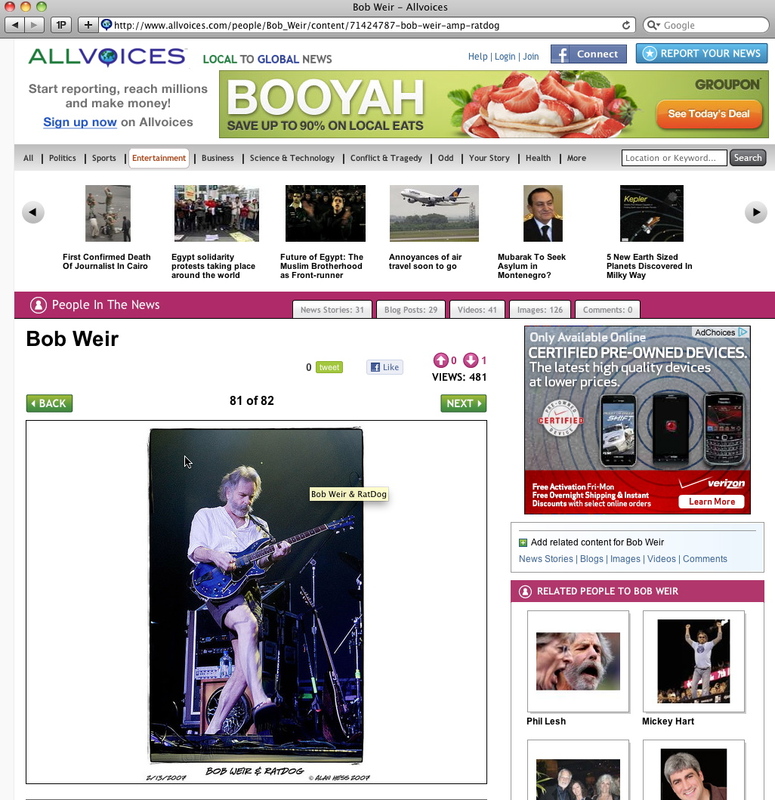 It turns out that they decided to grab my images of Bob Weir and RatDog from my flickr account. Thats right, they just took the images and never bothered to ask. I sent a takedown notice to the website and asked where to send the invoice for the usage fees. The answer I got back from the company is amazing, they think this behavior is legal. Thank you for contacting Allvoices regarding your copyrighted images from Flickr that appeared on Allvoices. Pursuant to the “safe harbor” provisions of Title 17, United States Code, Section 512(c), upon receipt of your emails and per our policies and procedures we removed the referenced images from our website. Additionally, Allvoices has blocked your Flickr account from our system to help prevent a similar occurrence in the future. Please let me know if you have any further questions on the matter. a. You shall:Comply with any requirements or restrictions imposed on usage of the photos by their respective owners. Remember, Flickr doesn’t own the images – Flickr users do. Although the Flickr APIs can be used to provide you with access to Flickr user photos, neither Flickr’s provision of the Flickr APIs to you nor your use of the Flickr APIs override the photo owners’ requirements and restrictions, which may include “all rights reserved” notices (attached to each photo by default when uploaded to Flickr), Creative Commons licenses or other terms and conditions that may be agreed upon between you and the owners. In ALL cases, you are solely responsible for making use of Flickr photos in compliance with the photo owners’ requirements or restrictions. If you use Flickr photos for a commercial purpose, the photos must be marked with a Creative Commons license that allows for such use, unless otherwise agreed upon between you and the owner. What this means in plain terms is that www.allvoices.com had no right to use the images and did so illegally. And since www.allvoices.com is selling advertisements on their site, it is obviously a business that is in the business of making money. As of this writing, I have not heard a good reply back from www.allvoices.com as to why and how they think this is legal. If I do not hear back from them within 48 hours, the next letter they receive will be from my lawyer. So while www.allvoices.com has removed the first 17 images, there are still photos on their site being used without permission and those images have been registered with the US copyright office. I urge all photographers who use flickr to check www.allvoices.com to see if they might be stealing your images as well. It is time that companies realize that we work hard to take the photos we do. We practice, we buy equipment, we spend time and money developing our skill and we don’t give that away. PHOTOS ON THE INTERNET ARE NOT FREE. You want to use my images, fine, ask me and we can work out a licensing plan. Here is a screen capture showing one of my images being used on the www.allvoices.com website. Notice the big name advertisers on this page, including Verizon and Groupon. I wish you success in obtaining compensation! Either they don’t realize photos on Flickr are not necessarily covered by a CC license, or they think they can pull images from anywhere because it’s on a “publicly available” blog or website. Or they don’t care. Which leads me to the question, should photographers have a Flickr account? I haven’t had one until about a month or two ago. Not that my pictures are (yet) something someone would pull, but that’s what kept me from getting a flickr account in the first place. Now I’m thinking about closing it again. What are your thoughts on having a Flickr account? This is my first time here and I just wanted to stop by to say Hi! Alan, very timely post as I am in the middle of reading Ed Greenberg and Jack Reznicki’s book A Photographer’s Survival Manual: A Legal Guide for Artists in the Digital Age. I am also registered for your Pre-Con in Orlando next month. I am hoping you might touch on this very subject during your session. I am one who does not register my images but my business is getting better and I believe its now warranted and I need to step it up. Good luck. Looking forward to your class. I am having an attorney review Allvoices’ policy and what seems to me to be blatant copyright violations. They only require one out of three classes of “reporters” to publish content free of copyright violations but have a profit sharing platform with all three as listed on their “incentive” page. They are directly profiting from copyright infringing content that they have direct ability to control. I too have also had allvoices steal my photos, they have known about this problem since 9/4/10 the first time they stole from me, and were made aware that they were not allowed to use copyrighted photos from flickr and yet still kept others images online, including many more of mine that I had to have removed. there is no excuse for allvoices to have copyrighted flickr photos on their site when they were made aware of the problem last year and said they would fix it. They probably know that they are making income from the photos and dont care because its free use of photos and they refuse to compensate photographers for their use of copyrighted photos as they refuse to compensate me for a big handful of photos they stole. What¡¦s Going down i am new to this, I stumbled upon this I’ve discovered It absolutely helpful and it has helped me out loads. I am hoping to give a contribution & help other users like its aided me. Good job. Thanks for the great blog posting! I found your post very interesting, your a great writer. I will make sure to bookmark your page and return in the future. I like to find and revisit neat informative blogs like yours, keep up the great work, have a great week!